Various holiday celebrations and dinner/dances throughout the year - check our calendar at sedonaelks.org. Mission Statement To inculcate the principles of Charity, Justice, Brotherly Love and Fidelity; to recognize a belief in God; to promote the welfare and enhance the happiness of its Members; to quicken the spirit of American patriotism; to cultivate good fellowship; to perpetuate itself as a fraternal organization, and to provide for its government, the Benevolent and Protective Order of Elks of the United States of America will serve the people and communities through benevolent programs, demonstrating that Elks Care and Elks Share. Services and Projects The Elks National Foundation provides more than $3.3 million in college scholarships each year to graduating high school seniors. The “Most Valuable Student,” Eagle Scout, and Girl Scout Gold Award scholarships are open to any graduating high school senior. Legacy Awards and Emergency Educational Fund Grants are available only to children of Elks. The application process and deadlines vary for each of the programs. All applications, except for the scouting scholarships, must go through a local Elks Lodge before reaching the Elks National Foundation office. Contact your high school counselor for more information or contact us if you are a Sedona student. Sedona Elks Lodge is seeking donations to add a game library to the lodge. 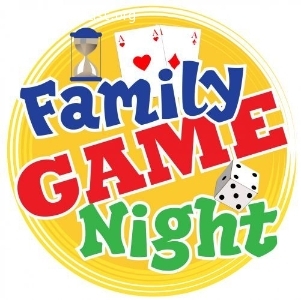 We'd love to have a bookcase (or 2) and gently used board games, cards, puzzles, etc to have on hand for lodge use. If you have something you'd like to donate, please contact Exalted Ruler Cindy Wilmer at 928-351-7430 or drop your items by the lodge during office (M-F, 1-4pm) hours or when the lounge is open. Thank you! Volunteers and New Members Needed! 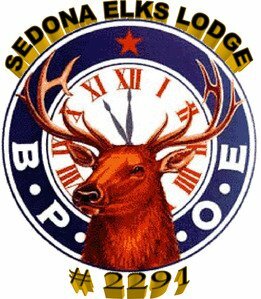 Sedona Elks Lodge would love to have you join us as a new member! We are seeking active new members to help with lodge and community activities. In particular, we are looking for volunteer cooks and kitchen help for lodge events, including our regular food service nights on Wednesdays and Fridays. Whether you already know what you're doing or are willing to learn, we'd love to have you! Paid opportunities may eventually be available through our facility rental services. 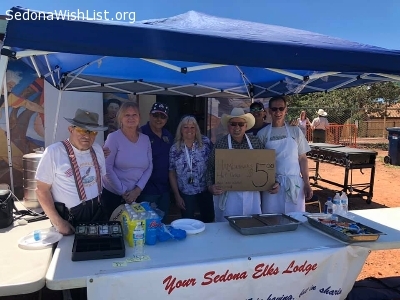 Sedona Elks Lodge participates in a multitude of community events including the City of Sedona's annual Breakfast with Santa Claus (we provide the breakfast, coffee, etc), Dictionaries for Kids in the local schools, and trips and donations for local Veterans. Stop by and check us out - we'd love to have you join Sedona Elks! And you can't beat the view!